Welcome back to Year 5F’s blog for this first week of the new half term. Maths – This week it has been all about ANGLES in Maths. We measure angles in degrees using a special piece of equipment called a protractor. Did you know that there are FOUR types of different angles: acute angles (measure less than 90 degrees), right angles (measure 90 degrees exactly), obtuse angles (measure more than 90 degrees but less than 180 degrees) and reflex angles (measure more than 180 degrees but less than 360 degrees)? We have been busy measuring angles, drawing angles and working out missing angles on a straight line! How clever is that? English – We have been writing a recount this week all about what we have been up to over the half term holiday. Many of us have written about Halloween and what we did, some of us have been away on holiday to amazing places like Windsor, The Lake District, Blackpool, Southport and even China! We have also been working hard on our spellings for this week…knowledge, medicine, mention, natural and naughty. Thank you for all your hard work learning them at home too. Topic – We have begun a new topic for this half term entitled Valhalla. This topic is all about The Vikings – we are all very excited about this fascinating, interesting new topic! We have completed a mind map to show what we already know about the vicious Vikings! They have also completed a timeline and placed the time the Vikings lived in Britain on to it. Did you know they invaded and settled here from 793 AD till 1066 AD, when William the Conqueror came over from France? Science – We have begun a new topic all about Animals including humans. The children have been finding out about the human life cycle. Interestingly, our life cycle can be separated into six different stages: foetus, infancy, childhood, adolescence, adulthood and elderly. They have gone on to explore the development of a foetus in its mother’s womb: how it grows and changes over a nine month gestation period. An Australian boy named Dylan lives with his grieving dad who, following the death of his wife in a car accident, has lost interest in his son and life in general. Dylan takes solace in his mischievous grandfather and his talent for making paper aero planes. 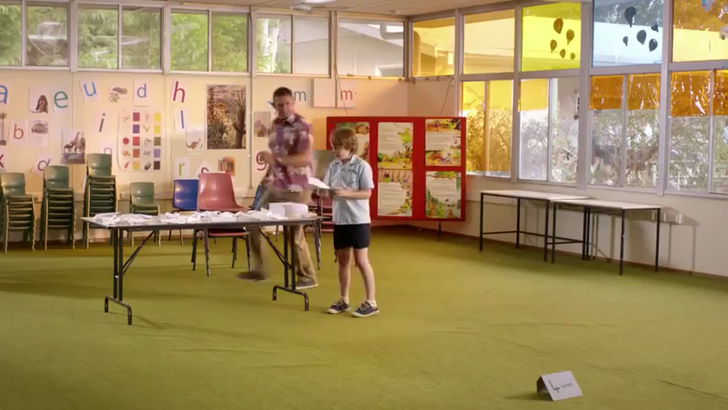 When this skill is spotted he attends trials that see him chosen to represent Australia at the World Paper Plane Championships in Japan. After rowing with his dad, Dylan leaves for Japan with spoilt team-mate Jason, where he befriends fellow competitor and paper-folding prodigy Kimi. Can Dylan overcome the competition and make up with his dad? Click on the video window below to watch a trailer for this great movie starring Australian actors Sam Worthington as the father and Ed Oxenbould as Dylan, his son. So, as you can see it has been another amazing week here in Year 5. All that remains to say is to have a fantastic weekend and we will see you back in school on Monday.